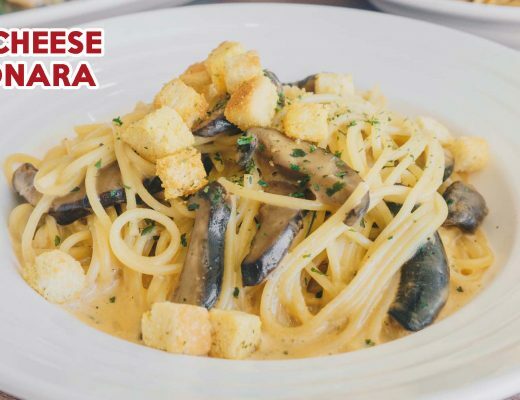 Besides ma la, the other thing that we love is extra large dishes at low prices. Flying Wok is a good example of this. 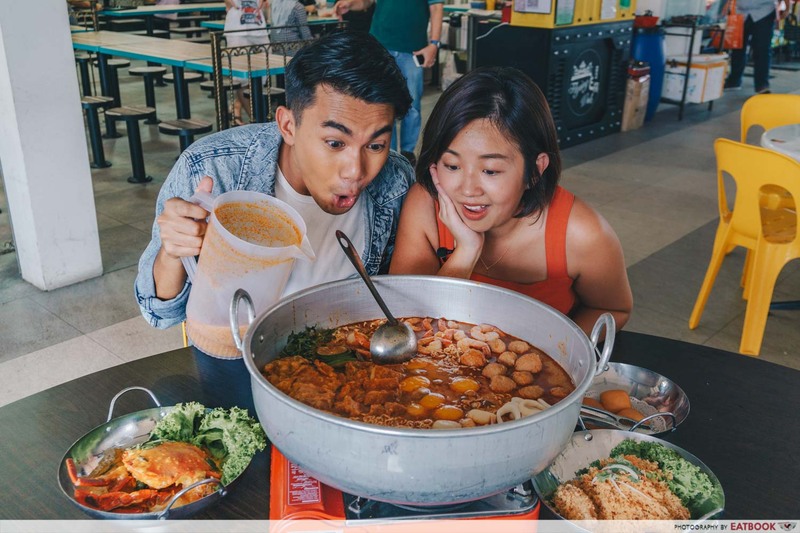 This Sembawang eatery serves a cauldron of tom yum soup that can feed pairs or big groups at prices that will not break your bank. Your eyes are not playing tricks on you. 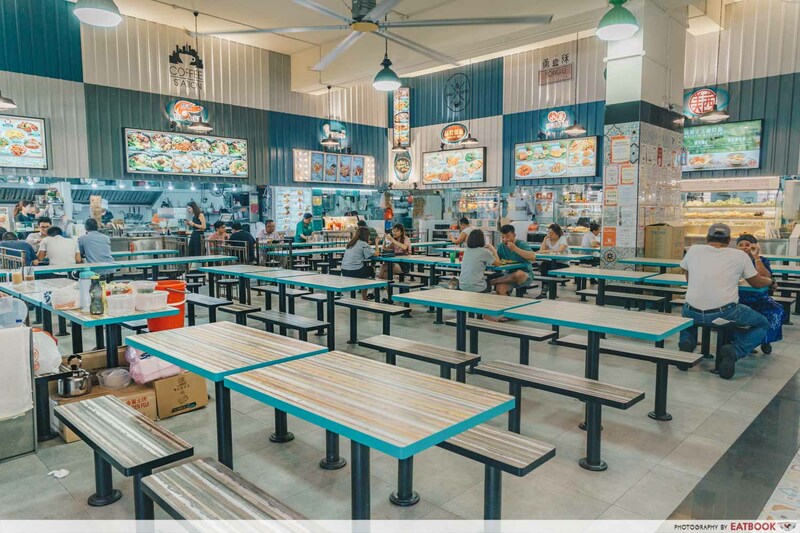 This halal-certified zi char stall offers the tom yum hot pot in a variety of sizes. 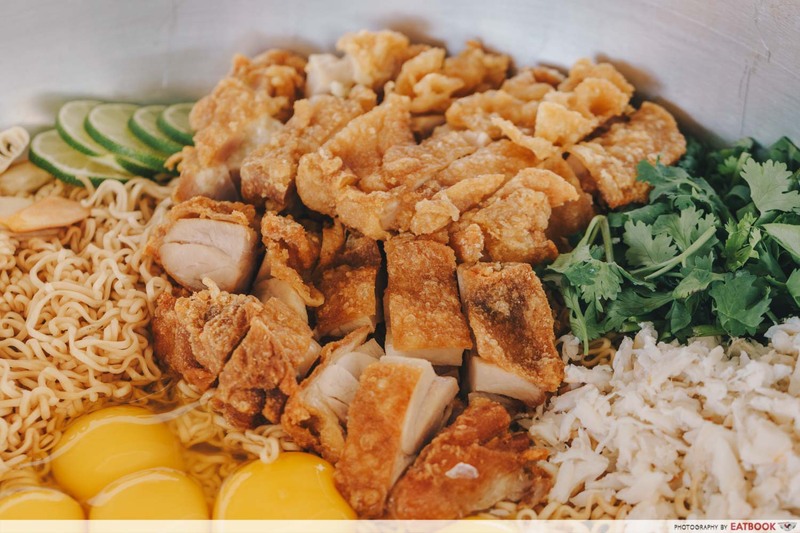 A small Jumbo Mama Wok, which serves one to two people, will set you back $13. The medium ($22) portion serves three to four, and the (extra) large ($79.90) one serves eight to ten. Those looking to stretch their dollar even more can opt for the cheaper version at $49.90 for a large pot. 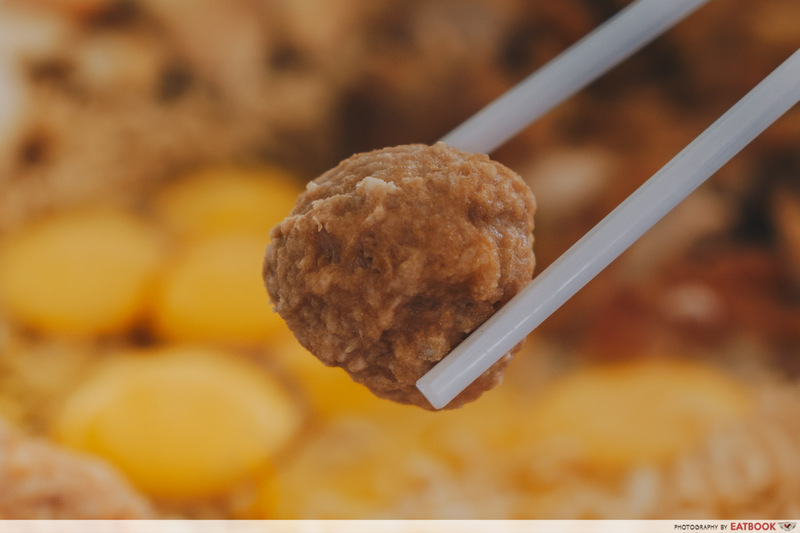 It comes with lesser seafood and an assortment of mushrooms, fishballs, and cheesy hot dogs instead. 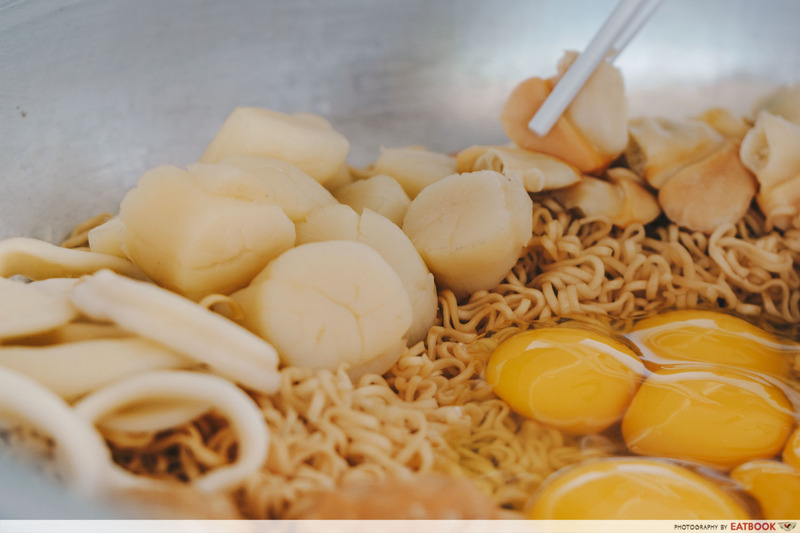 We were fascinated by the immense size of the hot pot as well as the generosity of the toppings for the large Jumbo Mama Wok. 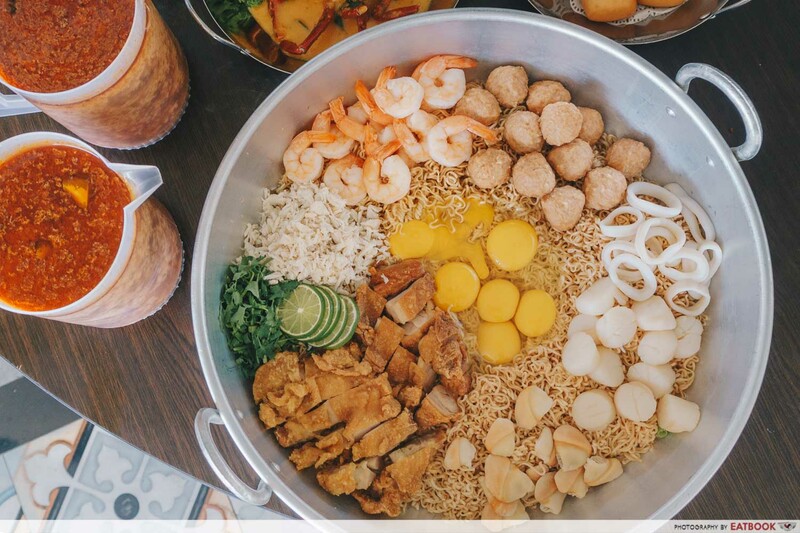 There were scallops, squid, pacific clams, real crab meat, peeled prawns, chicken meatballs, fried chicken cutlet, eggs, and a base of Maggi noodles. The plump, juicy scallops were my favourite out of the seafood bunch. They were sweet and thick, unlike the thin ones served at many restaurants. The prawns were equally plump and were peeled beforehand for your convenience. I was initially confused by the addition of shredded real crab meat, as it would get lost in the huge vessel of soup. However, after adding some into my individual bowl, I thoroughly enjoyed how the bits elevated each spoonful with its texture. Make sure you scoop the pile of crab meat into your bowl before it’s too late. The deep-fried chicken chop was a welcomed addition. 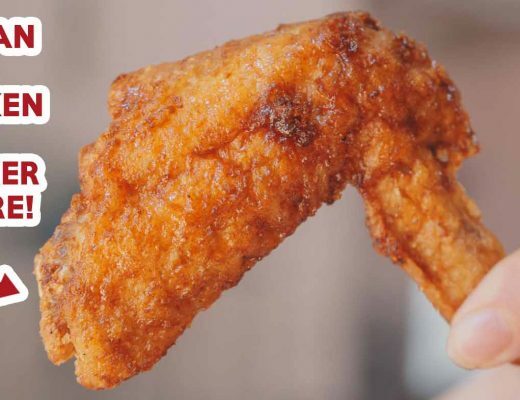 The skin and batter possessed crispiness like that of a well-baked bacon. Along with the thick chunks of juicy chicken meat, it was a nice contrast to the predominantly seafood hot pot. 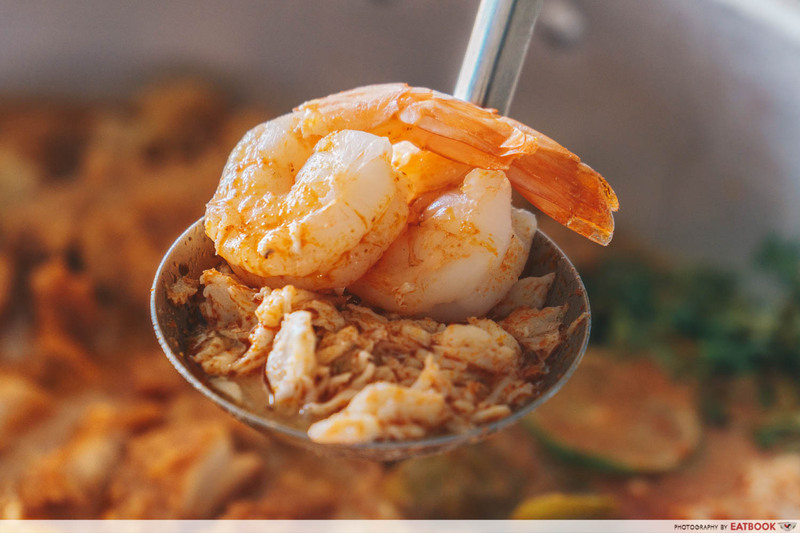 Similar to the crab meat, do not let the potent tom yum broth taint the crispy parts by eating them immediately. Not everything in the pot came together as a cohesive bunch. The chicken meatballs stood out, but not in a good way. On its own, it was flavourful. However, with the broth, the meaty aroma clashed with the tom yum and was an overkill. The seven eggs in the middle raised a few eyebrows too, as it was uncommon to see eggs added into tom yum soup. You can beat them straight into the broth for a creamier base, or let them bubble till they’re poached, without altering the taste or texture of the soup. The tom yum broth was served in two huge 1.5-litre jugs. 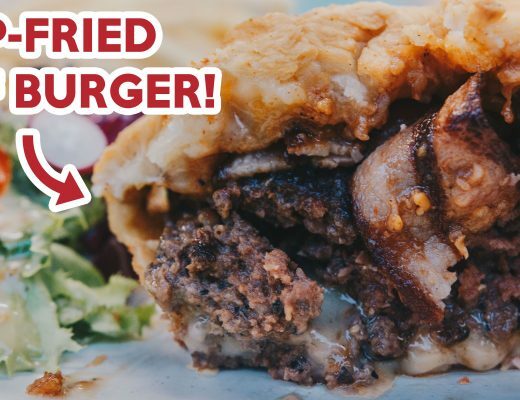 It was piquant and only mildly spicy – great for sharing amongst a large group of friends with different tastes and preferences. That being said, it was missing the iconic tanginess from limes and kaffir lime leaves. I appreciate a hearty bowl of tom yum soup, characterised with the right amount of heat and sourness. 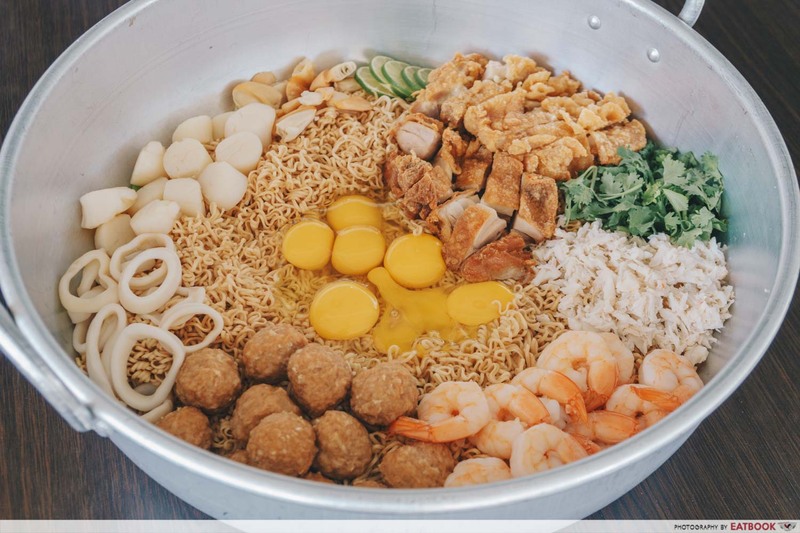 The menu might state that the large Jumbo Mama Wok will feed eight to 10 people, but the sheer amount of instant noodles begs to differ. 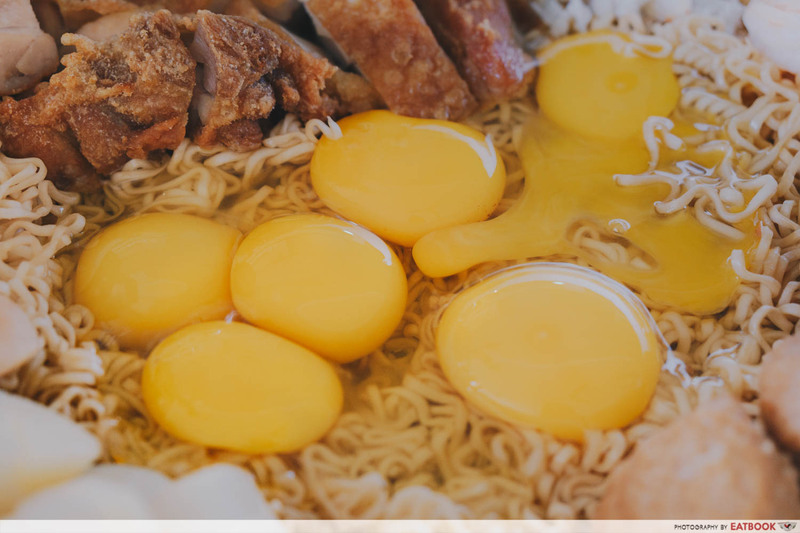 A total of 13 packets of Mama instant noodles were used. Along with the added toppings, it felt like a group of 15 girls were needed to finish the dish. 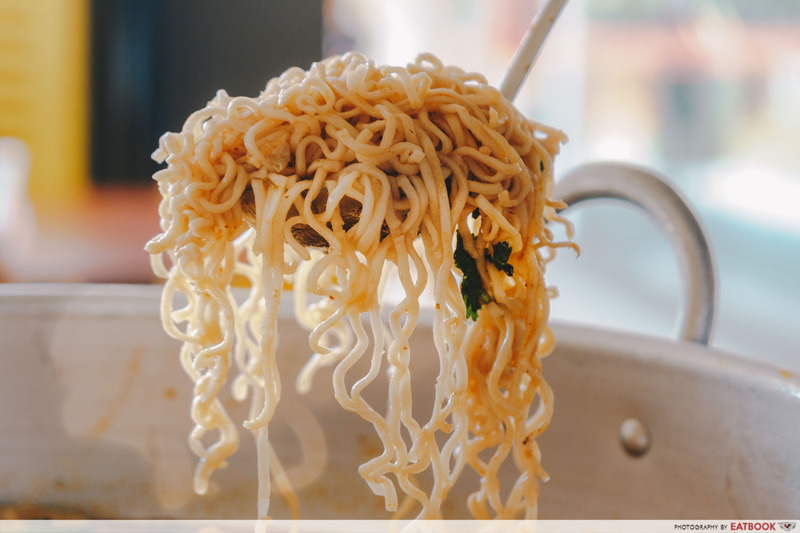 Word of advice: be careful not to let the noodles turn soggy! Just like the new and upcoming Canberra estate, the coffee shop that Flying Wok resides in also has a hip flair to it. 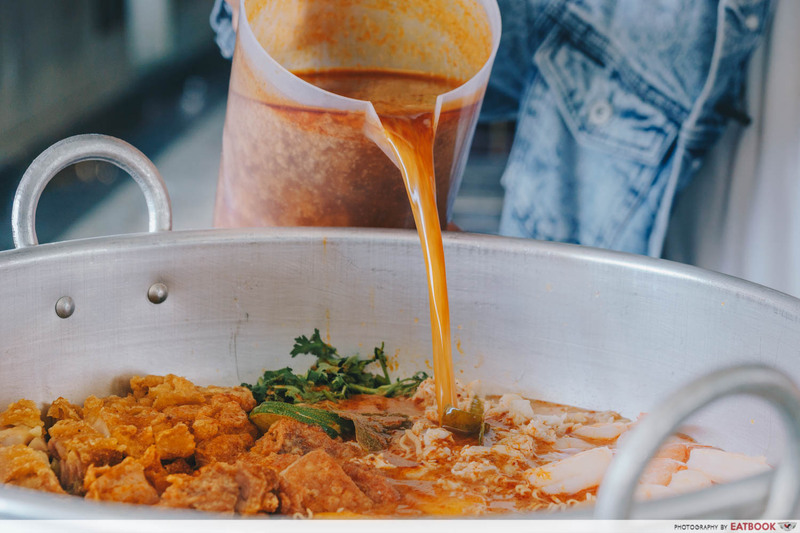 It might not be air-conditioned but the XXL fan above provides just the right amount of wind to cool down those who can’t take the spiciness of the tom yum broth. The three litres of tom yum broth might not taste the most authentic, but the generous servings of premium seafood definitely make up for it. Manage your foodie expectations and come down with the intention of leaving with a full belly and a good time instead. 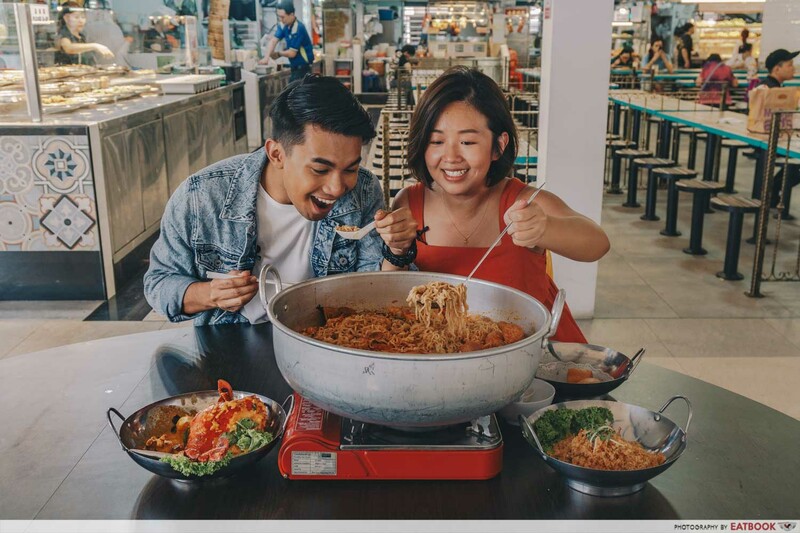 If you’re looking for more XXL dishes to feed your horde of friends, check out Im Thai Kitchen, which serves Thai basil chicken rice out of a huge metal tray, and The Thai Society, for a tongue-numbing mega bowl of ma la boat noodles. Flying Wok is a halal-certified eatery.